2-4 sentences explaining how you are connected to and learn with your affiliate members. I am President of CVCUE, our Affiliate meeting was well attended. We played CVCUE Bingo, met fellow members and had a raffle. It was a great meetup! 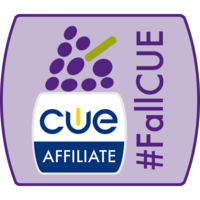 I am currently president of our proto-affiliate, #NorthStateCUE! This photo is of our "emerging" affiliate meeting. We should be an official affiliate within a month! Board meetings are the 1st Thursday of every month. Open to anyone, please come, @ 530 Selma Spike and Ale. We have an awesome group of people who travel a great distance to share knowledge. Make sure to attend CVCUE spring event in April. SGVCUE is 1 awesome affiliate. Although our Board is small in stature, it's powerful enough to host last week's Tech Fair of 450 attendees! My affiliate is awesome. CVCUE puts on two PD events a year; they are inexpensive and always draw the neatest people. They also give members opportunities to present so they can get ready for big gigs like CUE. We have a couple of mixers a year and sometimes CoffeCUES, as well. The people are super nice.